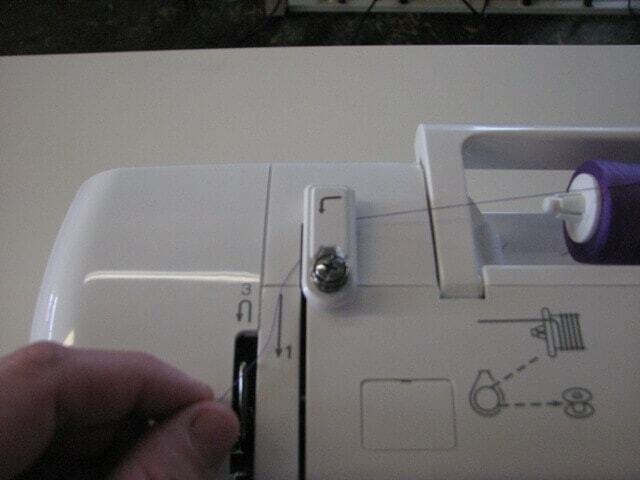 Today I’m going to teach you how to thread a sewing machine. 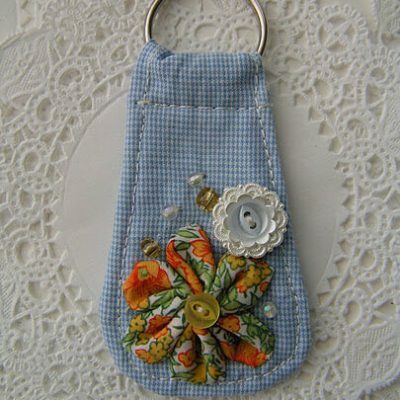 The feedback from my last post, sewing basics was great! 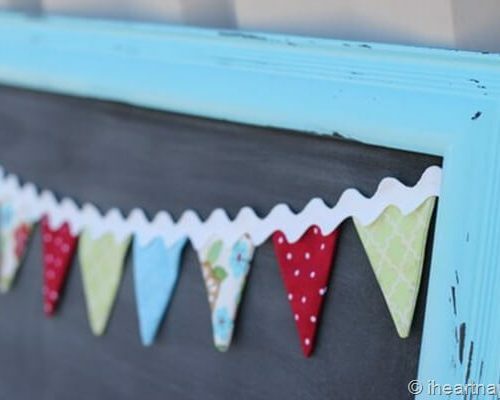 It was so nice to hear I’m not the only one with sewing fears. 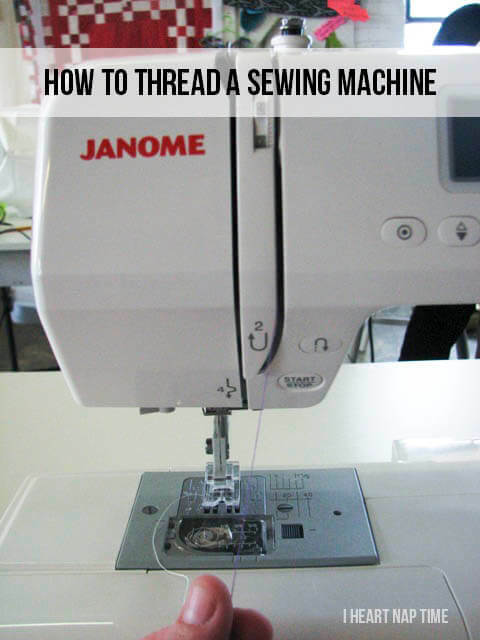 Several of you mentioned that you aren’t even sure how to thread sewing machine or put in the bobbin. So today’s post will cover exactly that. NOTE: I’m showing how to thread the machines I have here in my shop, but I’ve worked with several different brands of machines and the majority of them follow the same steps. If your machine doesn’t look the same as the one I show in my photos, I’d recommend you consult your user manual or even do a search on Google based on your machine model. Check out this cool animation on How Stuff Works that illustrates how a sewing machine creates those magical stitches. 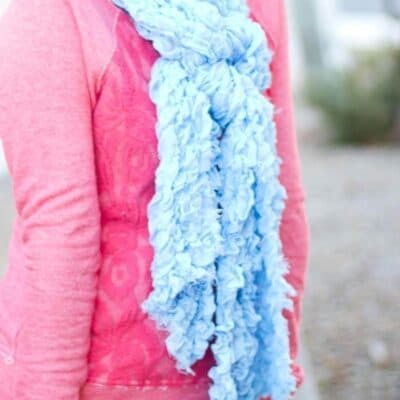 The stitch that our machines make is the second animation called a Loop Stitch. Actually, first we’re going to cover how to wind a bobbin because it never fails that once you get your entire machine threaded, you realize you don’t have a bobbin to match your top thread. And that’s pretty important. 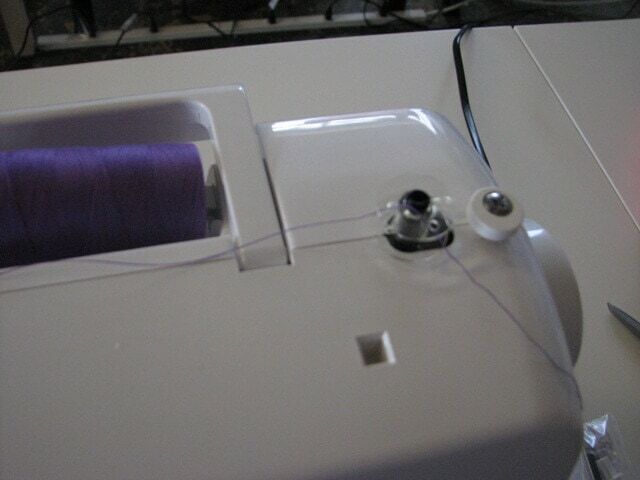 Next put the thread spool on the spool pin at the top of your machine. 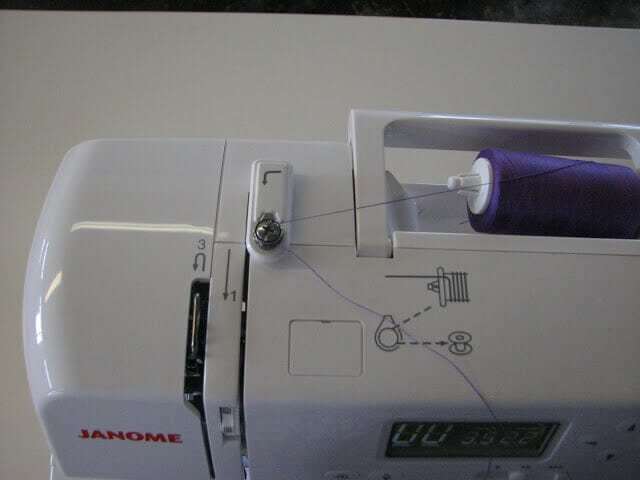 If the spool pin is horizontal, as it is on my machine, make sure the thread unwinds to the left off the spool, that will prevent the thread getting stuck as you sew. If you have a spool cover/stopper, slip it on the spool pin to hold the spool on. To wind a bobbin, you’ll need to pull the thread around the bobbin tension disc. The bobbin tension disc usually has a screw on the top of it and if you’re luckily, you’ll see a little drawing on your machine (like mine has) referencing that as the place to put your thread for winding the bobbin. The most important thing to remember when you wind your bobbin is that the thread has to go in the middle of the bobbin and up through one of the holes on the top. Next pop the bobbin on to the bobbin pin. You’ll probably have to push the bobbin over to the right to set the machine in bobbin winding mode. Now either press the pedal or the bobbin winding button to start winding the bobbin. It should stop when the bobbin is finished winding. This machine has a drop in bobbin so the bobbin drops in on the top of the machine. Once the bobbin is in the machine, you’ll need to thread the machine. 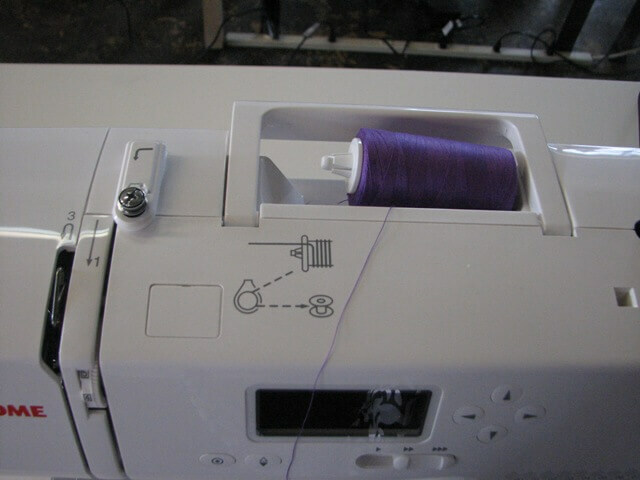 Follow the arrows/numbers on the machine and pull the thread behind the upper tension disc. It should fit snugly in that disc. This is what make a nice smooth stitch, and it can be adjusted but I don’t really recommend it unless your stitches don’t look smooth. You’re doing great by the way, and we’re about halfway done! 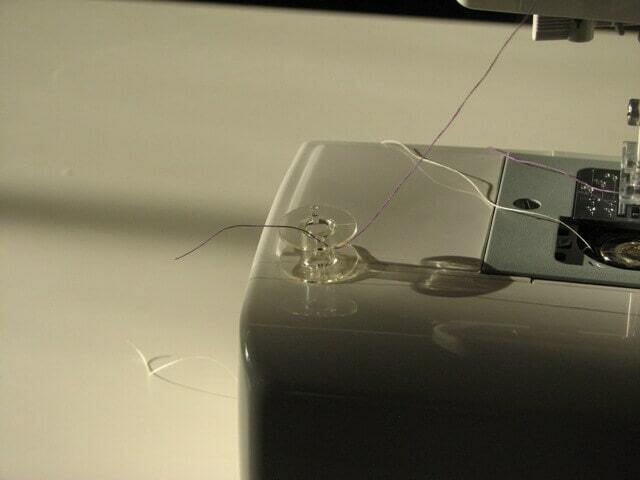 Number 2 in the threading process, pull the thread down in front of you and make a you shape (see the arrow?) up to the top of the machine. Move the thread to the back of the opening behind that metal take up lever (the metal thing that is sticking up) if you can’t see the takeup lever, turn the wheel on the right side of the machine toward you until the lever is sticking up. Some machines are made where that takeup lever does not stick up beyond the top of the machine. That’s OK, if you pull the thread to the back and forward to your left, you should catch it in the takeup lever groove. Again, follow the arrows, back down in front of the machine. Now this is where machines differ slightly. This machine has a flat metal hook at the top (just below that number 4) that the thread needs to go behind AND another flat metal hook just above the needle on the left. Some machines will just have one hook by the needle. Finally, thread the needle (sometimes that’s the hardest part) and pull the thread down through the opening in the presser foot. Whew! You did it! You threaded your machine! 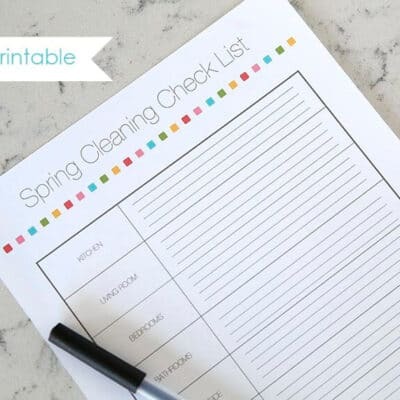 You’ll need to pull the bobbin thread up to the top. To do this, turn the wheel on the right side of the machine toward you. That will catch the bobbin thread and pull it up to the top. Congrats you are now ready to start sewing! So tell me now, which do you want me to show next, button holes or zippers? 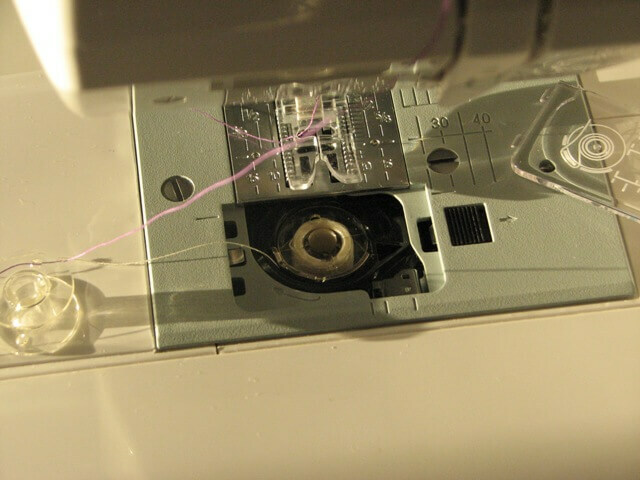 i find it really amazing and enjoying to thread a sewing machine. its always an interesting part for me. The thread sometimes do not comes from the bobbin. what should i do then? 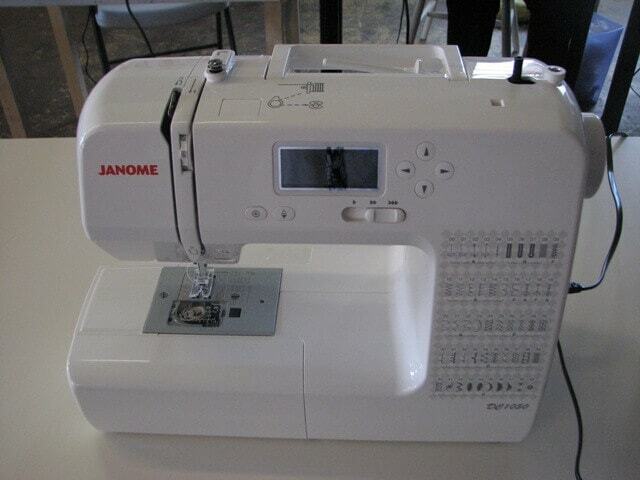 I just got a Janome. My first sewing machine. 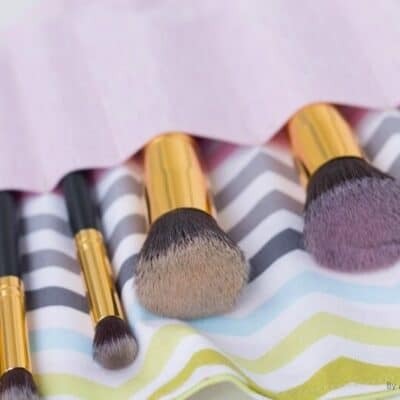 I have quickly discovered tutorials. I feel very fortunate technology is on my side! 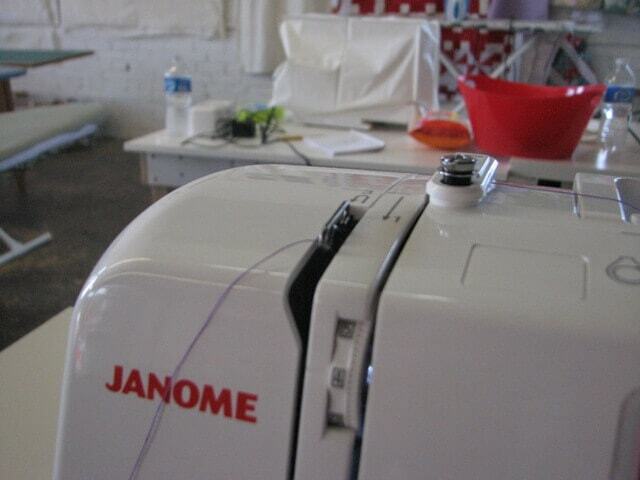 How do you drop the feed dogs on Janome so as to do free motion quilting? Can you tell me how to thread and bobbin an EDNA machine. Know this is old, but rarely used.